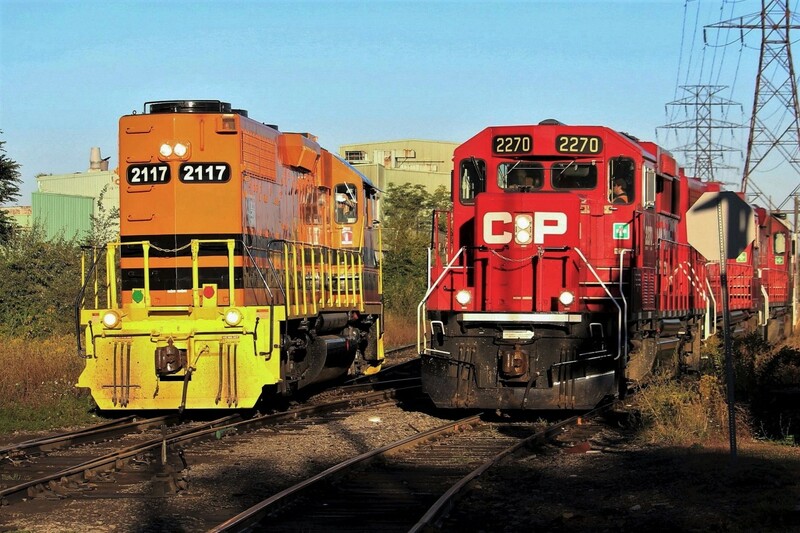 Railpictures.ca - James Knott Photo: Planned to spend the entirety of the 29th railfanning. Went out that morning, grabbed a coffee, and got going just in time for the lighting to start getting nice. First stop was the industrial area, starting around Bunge and working eastward. Stumbled upon SOR and CP both working the interchange. 2117 had been out of service for some time and only recently returned in the days before this shot. If you look closely, it looks like the engineer in 2117 is either hiding from the low morning sun or my camera. Or both. From here, 2117 would run long hood/light power to NSC where it lifted some SPMX hoppers (for Shell I believe) and CN centrebeams before returning to this area to double its train and head back to Stuart. The Belt Line job headed onward towards Strathearne. Seems to be pretty consistent (or lucky?) that I have been finding CP in the Ottawa Street North area Saturday mornings around 08:00/08:30 or so. | Railpictures.ca – Canadian Railway Photography – photographie ferroviaire Canadienne. Caption: Planned to spend the entirety of the 29th railfanning. Went out that morning, grabbed a coffee, and got going just in time for the lighting to start getting nice. First stop was the industrial area, starting around Bunge and working eastward. Stumbled upon SOR and CP both working the interchange. 2117 had been out of service for some time and only recently returned in the days before this shot. If you look closely, it looks like the engineer in 2117 is either hiding from the low morning sun or my camera. Or both. From here, 2117 would run long hood/light power to NSC where it lifted some SPMX hoppers (for Shell I believe) and CN centrebeams before returning to this area to double its train and head back to Stuart. The Belt Line job headed onward towards Strathearne. Seems to be pretty consistent (or lucky?) that I have been finding CP in the Ottawa Street North area Saturday mornings around 08:00/08:30 or so. Yeah I’ve seen them down there at all different times of day and more than once in the same day, and was aware of the pusher thing. The Saturday morning at Ottawa Street N has been pretty steady lately is all. Also has to do with current mainline schedule as Kinnear (London ATM) yardmaster will have em on standby for pusher service. Schedule does change.